I've been testing the Buffalo Cloudstor with an eye toward it helping me better manage my photography content, both in the studio and while on the road. I have good news and bad in this regard. We'll start with a brief overview of the Buffalo network drive and the good. What Is the Buffalo Cloudstor? For testing, I purchased a Buffalo Technology CloudStor 2-Bay (1 x 1 TB) Gigabit Ethernet Network Storage CS-WX1.0 for $129. I thought was a great price for a unit that provides Raid 1 mirroring between the drives, network connectivity, and software to make cloud access a snap. To get set up, all I had to do was connect the drive to my Airport base station via the supplied Ethernet cable and turn on the drive. I then registered with PogoPlug (Buffalo's online partner), downloaded the desktop app for my Mac, and spent about a half an hour configuring the set up. The only problem I had during this process turned out to be my own fault. When I first got the Buffalo, I swapped out the 1 TB drives for a couple of 2 TB drives that I already had. The Cloudstor didn't like them for some reason. But I didn't know that at first. I thought I was having connectivity problems, but in reality, it was the swapped out drives. When I finally figured out to put the original 1 TB drives back in, every thing worked great. Go figure. Even though the Buffalo can perform a variety of cool tasks, such as serving up your iTunes library from afar, I was basically interested in two things. First, I wanted it to store my master Raw files so I would have access to them from anywhere in my studio, and while on the road. My workflow is that I work with a referenced Aperture library on my MacBook Air while traveling. So I have a hefty library full of thousands of Jpeg previews with me. But every now and then I need the original Raw file, and having those available via the cloud would be handy. Since my Projects in the Aperture library are organized the same way as the referenced file folders on my external drives, finding a master image is a snap. On average, it took the Buffalo Cloudstor about a minute and a half to download a 27 MB Raw file from a remote location. Not blazing fast, but workable for those times I need a couple masters while on the road. In the studio on the local area network, it was faster. 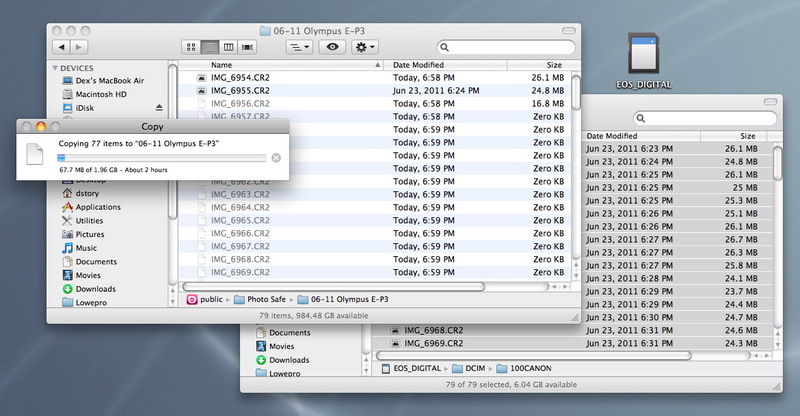 The second task I was interested in was using the Cloudstor as an image backup device while I'm working on location. Wouldn't it be nice to upload a day's shoot from the hotel and know that all of your Raw files are safe and sound back home? Unfortunately for Raw shooters, the technology just isn't there yet. I tried a sample shoot of 79 Raw files that totaled about 2 GBs of storage, and uploaded them off the card via my MacBook Air to the Buffalo Couldstor about 6 miles away at my studio. A 2 GB upload required 2 hours to complete via the cloud. Even with really good cable Internet access on both ends, the upload took 2 hours. On a normal day's shoot, I rack up between 300 and 600 Raw files, and the Internet connection on the road often isn't nearly as good as what I tested at home. So it's conceivable that the upload would not be finished by the time I got up the next morning, or that the Internet connection would timeout before completion. 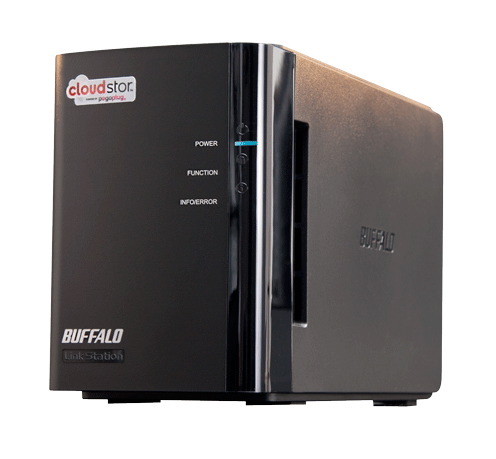 The Buffalo Cloudstor network drive is a terrific value considering that you get TBs of storage, easy to use software, and all of this capability at a great price. You can use it to share files on your local area network, and better yet, remotely via the Internet. You can preload it with your master image files by connecting a separate hard drive via the Cloudstor's USB port on the back of the unit, then access those files from anywhere you have an Internet connection. It's not the fastest server on the planet, but it's fine for small batch downloads. It can also serve as a back-up for traveling photographers, but it's not practical for large batches of big Raw files. If you shoot Jpegs, you'll most likely have a good experience as long as you have good bandwidth. You wrote that you have fast cable connections on both ends. Even fast connections may have limits. Have you looked at the upload speed of your connections? Most of the time, DSL and cable companies sells their product based on the download speed (say 15 Mbps), but the upload speed is way slower than that (say 1 Mbps). Som your upload from home to office could be related to this limitation, not the device itself. If you're on the LAN and upload your master from the Air to the drive, does the speed improve a lot? If so, my guess is that the drive is not to blame. I'd like to read your comments on this. Well, Steve, your guess is wrong :) I have cable service for my Internet connection on both ends, and the upload speed is very good. I've looked. Plus, I'm not criticizing the drive anyway. If you read my post again, you'll see that I think the Buffalo Cloud is a great value. It's just not capable for backing up large quantities of Raw files remotely. And my guess is, that there isn't a great personal solution at the moment outside of Buffalo either. But, I still like the drive very much, and I'm having fun learning how to work with it. The Buffalo Cloudstor outperformed the Segate BlackArmor drive that I have set up at the same location (and that I like a lot), but took a bit longer than the professional service. All in all, a very good performance from the $129 Buffalo Cloudstor. This looks like a really interesting backup solution for those of us on a budget. Would you be able to access it remotley with an iPad? The actually have an iOS app called Pogoplug that works great on the iPad and the iPhone. Helps integrate your online personal cloud with all of your devices. Because upload speeds can be slow, Mosaic mails customers external drives. Mail can be much faster for large chunks of data. Any changes to the RAW files made in Lightroom can be synchronized over the web because Mosaic is able to just sync the changes and doesn't need to re-upload the whole file. I remember you mentioned on TWiP you had been looking at this drive as part of a new course on Lynda.com - has that gone live yet? I have a horrible feeling that the Cloud backup ideal for the traveller will stay illusive. Even if bandwidth improves, the increase in hi-res video files and megapixel count will probably outpace it. How solid is the RAID 1 implementation on the Cloudstor? I have been on the lookout for something where I can cycle a couple of drives to get one off site periodically. To do this I need a good hot-swap and quick rebuilds. I would love to have your opinion on it. I like the Buffalo Cloudstor, but I doubt that it will meet your needs as well as mine. I use it for light backup, not for my main archiving. But I'm glad to have it. Thats a fair criticism. I have a cunning plan for something to help folks choose interactively but it will depend on how much free time I have. Its hard to keep up with the speed of changes. The day after I published the article a host of 4Gb drives were announced. Still waiting on Thunderbolt though. This is a good personal cloud system if you were going to start put files there from scratch. I am using it as an upgrade and found uploading speed very slow. There fact that this may not be the problem of the the unit itself, I was relying on the direct copy option that this Buffalo unit has. However, the direct copy was not robust and many times not all the files are direct copied and then it abandoned itself. This make going back to check which files may have missed extremely tedious. Overall it is good if you start putting files to it as new. But if you already had a large loads of files to migrate over, there need to be a better alternative which I do not know or aware yet.